Figs. Quite possibly the most beautiful edible fruit in existence. They are at their peak in Charlottesville, and I can't get enough of the soft globes that are actually inverted flowers (Did you know? I did not. Thanks, Megan!). We foraged for them over on Beyond the Flavor, joining our friend Daniel as he visited some of his favorite fig-gathering haunts around the city. Eagerly awaiting their arrival each September, I've been known to stake out trees on the University of Virginia grounds; faithfully driving by each day for weeks waiting for the green fruit to turn rosey, only to be foiled by a student who reached the trees an hour before us on the day they were finally ripe. The sight of his retreating form, bag of fresh figs full to bursting at his side, still saddens my heart. On Beyond the Flavor, we've asked our readers to submit their favorite fig recipes. 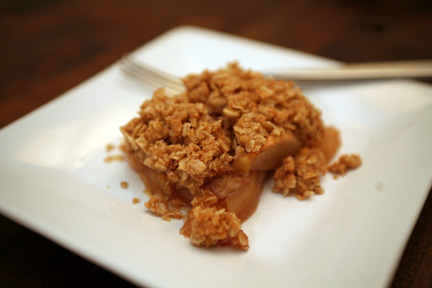 (Like us on Facebook and submit your recipe here, if you've got a favorite to share. There's a prize for the winner!) While my preferred way to consume a fig is fresh, straight from the tree, I wanted to try something new for this little contest we're holding. I thought about a savory treat, but settled on sweet because, let's be honest, that's my area. A quick internet search resulted in this recipe, whose simplicity and un-touched figs caught my attention. There were obstacles that stood in my way - a lack of sour cream in the refrigerator and an oven that broke in the middle of baking the crust - but I persevered and was able to share four pieces amongst friends. The firm crust with a cornmeal crunch paired nicely with soft, lemon-scented cream and the pop of tiny fig seeds between teeth. We four enjoyed it immensely, outside under the stars, while our friends' dog enjoyed the leftovers on the countertop in the kitchen upstairs. A disappointment, for sure, as I had at least one more piece earmarked for the next morning's breakfast. My craving not fully satisfied, I'll be making this tart again. As soon as we fix the oven. Pulse together flour, cornmeal, sugar, and salt in a food processor. Add butter and rosemary and pulse until mixture resembles coarse meal with some small (roughly pea-size) butter lumps. Drizzle evenly with 4 tablespoons ice water and pulse until just incorporated. Gently squeeze a small handful: If it doesn't hold together, add more water, 1/2 tablespoon at a time, pulsing after each addition and continuing to test. Press dough evenly onto bottom and up sides of tart pan with floured fingers. Smooth dough with a small offset metal spatula or back of a spoon (floured if necessary), then roll a rolling pin over top of pan to trim dough flush with rim. Chill crust until firm, about 30 minutes. Bake crust in middle of oven until center and edges are golden, 25 to 30 minutes (don't worry if bottom of crust cracks), then cool in pan on a rack. Whisk together sour cream, mascarpone, sugar, zest, and salt in a bowl. Remove side of tart pan and spread mascarpone cream in shell. Cut figs lengthwise into 1/4-inch-thick slices and arrange decoratively over cream. For those of you missing more regular Bella Eats posts, you really should hop over to Beyond the Flavor. I am there more often than I am here, although I haven't given up on this little corner of the internet. I know I've said this before, many times, but I do hope to carve out more time to spend in this space I created nearly four (4!!!) years ago. After all, it was the inspiration for everything I am doing today with food and photography, and I can't bear to see it fade away. Many thanks to all of you who stick around, comment, and poke me with emails to say hello. I appreciate each and every one of you. xoxo. Brian and I have spent a total of maybe thirty nights apart since we were married six and a half years ago. We’ve racked up seventeen of those nights in the last seven months, since the beginning of 2012, and have another ten on the calendar for August and September. We’re each traveling for work more than ever before, being pulled to New York, Connecticut, Chicago, Florida, Philadelphia, New Orleans, and New Hampshire this year alone. An essential part of travel, for each of us, is the exploration of local food. Before we embark on a journey we ask friends, Facebook, and Twitter for restaurant recommendations. I look through the archives of Bon Appetit, Saveur, Gourmet, and The New York Times to see what I can find about the culinary scene. While visiting, Instagram is aflutter with food and drinks consumed. If we’re apart, iPhone photos are swapped between Brian and I; visual descriptions of whatever treats have been found both away and at home. We stay connected through the food we eat, never liking to spend a meal separately. The best part, though, is the gifts given upon return. That little piece of an experience apart that lets the other know they weren’t really that far away at all. From New Orleans there was duck jerky from Butcher and, that one time, two pounds of sliced ham from Mother’s. From Florida, a special spice rub from 4Rivers BBQ. The exchange goes the other way, too, with the homemade pot roast awaiting my return from New York in February, or the whisper of a ‘fruit surprise’ in the kitchen just two weeks ago. I’d returned early-ish on Sunday morning. Having photographed a wedding in northern Virginia with Sarah the night before, we’d each been anxious to get home to our husbands. An early departure with a quick stop at Starbucks had us back in Charlottesville by 10am, just in time for me to crawl in bed for the last 30 minutes of weekend snuggling with Brian and the pups. As we recapped our two nights apart, Brian rattled off the list of goodies he’d picked up at the farmers’ market the morning before. Excited to see my surprise, I padded out to the kitchen to investigate. And there sat the prettiest, rosiest apricots in my very favorite bowl. Just the thought of Brian coming across those apricots at the market makes me smile, because I know that he would never have picked them up just for himself. No, he saw the pretty fruits and thought ‘Andrea would like to bake something with these.’ and whisked them away to our house where, two days later, they were the stars of this cake. We adored this cake. Not too sweet (Brian's favorite kind) but bursting with the flavor of fresh apricots. The base has an almost poundcake-like consistency...dense and a bit spongey. The earthiness of the rosemary was the perfect compliment to the brightness of the fruit. Be sure to pick good apricots; they'll make all the difference. Put oven rack in middle position and preheat oven to 350°F. Grease a 9-inch springform pan with some oil, then line the bottom with a round of parchment paper. Oil the parchment. Finely grate enough lemon zest to measure 1-1/2 teaspoons and whisk together with flour. Add the chopped rosemary and whisk. Halve lemon, then squeeze and reserve 1 1/2 tablespoons fresh lemon juice. Transfer batter to springform pan and gently rap against work surface once or twice to release any air bubbles. Place apricot halves in a decorative pattern across the top of the cake, cut-side up. Sprinkle top evenly with remaining 1-1/2 tablespoons sugar. Bake until puffed and golden and a wooden pick or skewer inserted in center of cake comes out clean, about 45 minutes. Cool cake in pan on a rack 10 minutes, then run a thin knife around edge of pan and remove side of pan. Cool cake to room temperature, about 1-1/4 hours. Remove bottom of pan and peel off parchment, then transfer cake to a serving plate. I have been a little obsessed with ricotta cheesecake lately. I've made it several times, trying out a few different recipes, tweaking as I go. I've landed on one that I love but cannot seem to get a decent picture of it to save my life. And, quite frankly, I can't continue to eat ricotta cheesecake every other week. That doesn't work with the ol' 'stay in my jeans' plan. While browsing the produce section last week I came upon these lovely red pears and knew that a Thanksgiving dessert recipe must be developed to showcase their beauty. And then I thought, why not combine that idea with what I've learned about the perfect ricotta cheesecake? Voila, a new dessert star is born. This recipe combines three of my favorite things: seasonal fruit, tender crust, and ricotta cheesecake. Shared with loved ones it makes the perfect end to an Autumn meal. Enjoy, my friends! First, make the tart dough. Blend the flour and sugar in a food processor. Add the butter and pulse until the mixture resembles small peas, about 10 times. Add 4 tbsp of the water and process until the dough comes together, adding the last tbsp of water if needed. Gently gather the dough into a ball and press to a disk. Wrap with plastic wrap and refrigerate for at least 1 hour, up to 2 days. After the dough has been refrigerated, remove it from the plastic and roll flat to a circle approximately 12-inches in diameter. Lay the dough across a 9-inch tart pan and press the dough to the bottom and sides of the pan. Roll a rolling pin over the top of the pan to cut the excess dough. Prick the bottom of the dough with a fork in several places. Bake the tart crust for 10 minutes and remove from oven. Blend together the ricotta, cream cheese, 3 tbsp of the honey, the egg, and the vanilla extract until well combined. Pour the mixture into the tart pan and smooth the top. Lay the pear slices across the top of the ricotta mixture, and drizzle with the final tbsp of honey. Bake for 45-60 minutes, until the tart only jiggles slightly and is starting to brown at the edges. Let sit for 1 hour before slicing and serving. And here it is friends: recipe number 2 of 5 in 5 days...my very favorite sweet potato recipe yet. Oh. Yes. Its no secret around here that I like bread pudding. There are already two variations here on Bella Eats, and I have no doubt that there will be more in the coming years. When trying to come up with a new sweet potato dish this year (the marshmallow-topped, super-sweet casserole just doesn't do it for me) bread pudding popped into my head and nagged and nagged until I did a quick internet search to see if anybody else had tried it yet. Of course, I found a great recipe at The Kitchn (they've done everything already, haven't they?!?) and decided to try it out and tweak it if needed. Not surprising, it was perfect. Even after I cut the recipe to 2/3s (who does that?!?). If you don't have an 8x4 round soufflé pan and want to use a 9x13 instead, pop on over to The Kitchn for their proportions. Seriously, I hope you all try this recipe for a holiday meal this season. It would be great served right alongside the turkey, or drizzled with the caramel sauce for dessert. So delicious. Peel and cut the sweet potato into 2-inch chunks. Steam until tender (about 15 minutes). Set aside to cool. While the potatoes steam, generously butter a 8" round by 4" tall soufflé dish. 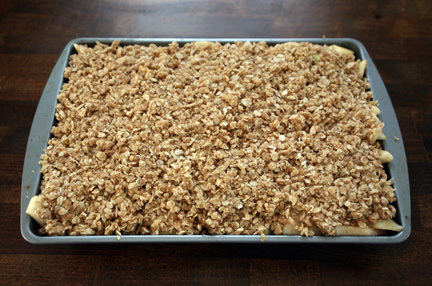 Or, a 9x9x2 baking dish would work, too, but your baking time may be a little less. Place the bread cubes in the dish. Whisk together the eggs, sugar, maple syrup, molasses, vanilla, spices, salt, milk, and heavy cream. Once the sweet potatoes are cool, mash or puree them until smooth. Add them to the egg mixture and blend thoroughly. Pour the mixture over the bread and press down the bread with the back of a wooden spoon to ensure all the bread cubes are soaked in the custard mixture. Let sit for about 20 minutes or up to 4 hours (refrigerate if it will sit for that long) while you preheat the oven to 350℉. Place the bread pudding in the oven and bake for 45-60 minutes, until the edges are browned and the custard is set. To make the sauce, melt the butter over medium heat in a small saucepan. Add the pecans and simmer for 3-4 minutes. Add the sugar and stir continuously until smooth. Add the cream and stir to combine. Simmer for about 5 minutes until the mixture is reduced to a thick sauce. Serve pudding warm with the sauce drizzled over top. Thank you to all of you still here from that first year, and all of you who have found me along the way. I can't wait to see what year four has in store! Preheat the oven to 350℉. Brush or spray the top of 10 muffin tins with vegetable oil and line them with 10 paper liners. Sift together the flour, baking powder, baking soda, salt, cinnamon, ginger, and nutmeg in a medium bowl. In a larger bowl, whisk together the eggs, pumpkin, sugars, and vegetable oil. Add the flour mixture and stir until combined. Divide the batter among the prepared tins and bake for 20 to 25 minutes, until a toothpick inserted in the center comes out clean. Set aside to cool completely. Cream the butter in a stand mixer with the whisk attachment. Scrape the sides of the bowl. Add the sugar and beat on medium high until fluffy. Scrape the bowl again. Add the maple syrup and beat until well combined. Pipe the frosting onto the cooled cupcakes. Caramel apples. The perfect Fall treat, bringing to mind images of carnivals and festivals and Halloween parties. I've made a few variations of candied apples in the past but this version is by far my favorite. This caramel is heavy and dark, laced with mollasses and dark corn syrup for an earthy undertone and not-overly-sweet flavor. If you're not a fan of molasses I'd avoid this recipe as, while not overpowering, the molasses does play a significant supporting role in the dance across the tastebuds. I loved this subtle difference from regular carnival candied apples that can sometimes make your teeth ache with sweetness. That's not to say that this particular caramel isn't sweet, because it is, it is just balanced nicely by that molasses addition. I'm not feeling too wordy today, friends, but felt the need to get this recipe out to you while there are still some orange and yellow leaves clinging to the trees. Especially to all of you northeasterners who are facing the first nor'easter of the year. What the heck?!? I assume there will be some time spent indoors this weekend, lamenting the loss of Autumn so early. Why not spend that time making the perfect Fall treat? Hello, Winter? Could you back off please? Combine sugar, butter, condensed milk, corn syrup, maple syrup, vanilla, molasses and salt in a thick-bottomed 2-1/2 or 3-quart saucepan. Stir with a wooden spoon on medium-low heat until all of the sugar dissolves. You can test this by rubbing a little bit of the caramel between your fingers (let it cool on a spoon a bit first!!!). There should be no grittiness. Brush down the sides of the pan with a wet pastry brush to dissolve any sugar crystals that might form on the pan sides. Attach a clip-on candy thermometer to the pan and cook the caramel at a rolling boil until the thermometer reaches 236℉, stirring constantly and slowly with a wooden spatula. Be sure to scrape the bottom of the pan as you stir, so that the caramel doesn't stick. Once it sticks it will burn, and you'll have to start over. Continue to occasionally brush the sides of the pan down with a pastry brush. Carefully pour the caramel into a metal bowl and allow it to cool until the temperature lowers to 200℉, at which point you are ready to dip the apples. While the caramel is cooling, prepare a large baking sheet, covering it with parchment paper, butter aluminum foil, or a silpat. 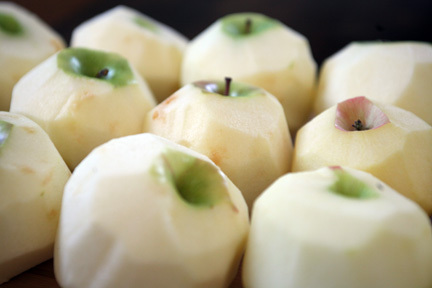 Insert your sticks into each apple core (I used a chopstick to poke the holes for the twigs). When the caramel has cooled enough for dipping, dip the apples in, one by one, by holding on to the stick, and vertically lowering the apple into the caramel, submerging all but the very top of the apple. Pull the apple up from the caramel and let the excess caramel drip off from the bottom back into the pan, then place the apple on the prepared baking sheet. 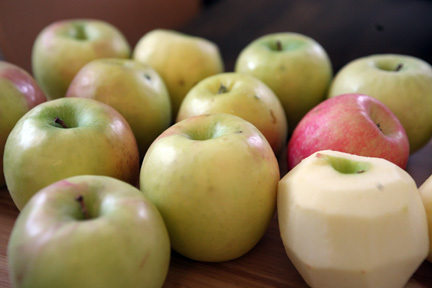 The caramel will pool a little at the bottom of each apple. Place the sheet in the refrigerator to chill for at least 15 minutes. At this point, if you'd like to add toppings, do so. Otherwise, allow the apples to chill for at least one hour. I recommend, after chilling, storing the apples at room temperature. Otherwise the caramel is hard as a rock. As promised, here is an apple tart to kick off your weekend. It is your reward for yesterday's salad love, friends. This here tart is one of those pesky editorial assignments that I was telling you about, the completely fun and delicious and right-up-my-ally projects that cause me to eat more sweets/sushi/potato chips/wedding cake than maybe I should. 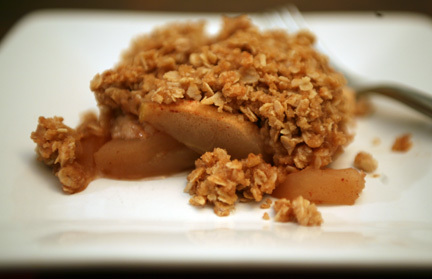 This particular recipe was made and photographed for C-Ville Weekly and published in last week's issue. I'm just a little behind in getting it up here on Bella Eats. But, for all of you Charlottesville folks, Relay Foods has all of the ingredients ready to add to your cart in one click should you choose to make this apple tart this Fall. And you really should, as it is simple and lovely and delicious...three qualities I strive for in most food coming out of my kitchen. Your tart will most likely look just a little bit different than mine because, well, I messed with the recipe a little bit. And wrongly, I might add. Your apples probably won't sit so high on the base, and the base itself won't be quite as dense. Even though I added a tad too much flour we still loved this treat. I can't wait to make it again, sticking to the recipe below. The pattern cut into the apples is, other than pretty, very helpful to slicing the tart in any way you might wish. Preheat the oven to 375°. Butter and flour a 9" or 10" cake pan, tapping to remove excess flour. Place the egg, sugar, salt, and lemon zest in the large bowl of a food processor. Pulse until mixture is starting to combine and then add the melted butter, continuing to pulse until smooth. Combine the flour and yeast, and add to the mixture in the processor. Pulse until evenly distributed, add the milk and vanilla, and then process until a soft batter forms. Pour the batter into the prepared pan and spread across the pan until it is level. Deeply score the 8 apple halves in a grid pattern. Place one half in the center of the cake pan and arrange the remaining halves in a circular pattern. Bake for 10 minutes, the reduce the oven temperature to 350° and bake for 35-40 minutes more, until a toothpick inserted into the center comes out clean. Meanwhile, combine the 2 tbsp apricot preserves with the 2 tbsp water in a small saucepan and stir over low heat until melted. When the tart comes out of the oven, brush it with the preserves and bake for an additional 3 minutes. Serve warm. I get questions quite often about my photography and how I capture the images that I present here. The most important piece of advice that I ever give inquiring minds is this: PRACTICE. If you reach waaayyy back in the Bella Eats archives you'll see that my photography has changed immensely in the nearly 3 years since I've been sharing recipes from my kitchen. In fact, I give this little weblog 100% credit for renewing my passion for photography after architecture stole it away for 10 years. When I began Bella Eats I relied mostly on my little Canon Powershot point-n-shoot camera, and quickly switched over to my DSLR once the focus of the site moved from a daily food diary to a more focused recipe + photography portfolio. With that change, the amount of time I spent capturing images for each recipe increased. With each post my eye strengthened and developed until I'd created a style all my own, certainly influenced by but never outright imitating other food photographers that I admire. The reason that my photography looks and feels as it does today is because I keep picking up my camera, keep following the blogs and magazines and artists that inspire me, keep challenging myself in new ways with each project I tackle. And I promise you, 3 years from now my photography will be different than it is today because of the life I will live during that time. Everything experienced in life is an influence on one's art. So...PRACTICE. It is the ONLY way to become the photographer you wish to be. Everything else is just details. And now, on to those details. This is by no means a comprehensive guide or the 'right/only' way to photograph food. I mostly hope to give some insight into how I work, and the decisions I make while capturing images for Bella Eats. I don't go into the technical aspects of working your camera, but simply challenge you to look at your photography from another point of view. If you have any specific questions, please feel free to ask them in the comments section! I first want to show you that I don't have a big fancy studio with a beautiful gourmet kitchen directly adjacent to it. Boy, do I wish I did! Someday... Right now Brian and I share a 10'x10' home office space, one side dedicated to our desks and computers and the other dedicated to my work table, some prop storage, and camera equipment. The end of that table is where most of my photography happens, unless I'm feeling like a different sort of lighting or need a bit more space, and then I'll move out to our dining room. (I'll show you the difference in light quality between those spaces a little later.) It is very helpful to have this dedicated space for photos, so that our dining room isn't constantly taken over with my equipment as it was for the first 2 years of writing Bella Eats. If you can manage to clear off a 2'x3' space to keep set up, I highly recommend it. 1. Temperature. My dining room windows face west and north, and these images were captured in the late afternoon, so the color cast in that space was much warmer than the cast in my office/studio, which faces east and north. 2. Direction of light. In the image on the left, the windows are to the left and in front of the camera, which highlights the cake stand nicely but casts more shadow on the right side of the cut piece. In the image on the right, the windows are to the left and behind the camera, which provides nice, even lighting on the cut piece but leaves the depth of the image more flat. The difference is especially apparent if you look at the folded end of the gray towel. Again, neither of these images represents the 'right' way to light a subject, just two different perspectives. And there are many, many more options! This is pretty self explanatory. Do as much set-up as you can before you step foot in the kitchen. Analyze the recipe, pick your backdrops, linens, dishes, and extra props. Set up the camera and stage the first shot while thinking about how you plan to capture the others. For something like these mini cakes, this step isn't as big of a deal. But if you have a cast iron pan of fajitas coming off the stovetop and you want to photograph the steam rising from those sizzling veggies, you better have your studio space ready to go! Just because a recipe for cake says that it should be baked in an 8-inch round cake pan, doesn't mean it has to be! Read through the recipe thoroughly and think about how you'd like to present the food. Individual cakes are fun to photograph, but a whole cake provides a slew of cutting/serving options. Will the food be photographed in the dish that it is prepared in? Or can you ignore the cooking dish because the food will be removed and plated? Do you want to capture multiple stages of the cooking process and, if yes, which of those stages should be documented and where? Analyzing the recipe will give clues as to what vessels should be used to present the food. Most often you can't go wrong with a white dish, but sometimes a colorful serving piece can really help to set off the colors in a recipe, such as these strawberry tarts on the teal plates shown below. Once I've analyzed the recipe and chosen the dishes I'll use, I pick the backdrop for the photographs. The backdrop has a huge influence on the overall feel of the images, taking it from rustic to refined with a switch from the pallet to the ebony floor sample. As you can see, Lowe's and Home Depot can be a great place to pick up photo backdrops. Once I've chosen the dishes and the backdrop, I move on to the styling of the images. Again, colors + textures can have a huge influence on the overall feel of the scene. Below I've shown examples of those little apple cakes styled in three simple ways, from neutral to pastel to festive. This recipe was pretty much a blank slate, given its neutral tone and white ramekin. But, imagine this beet risotto in that orange scene...blech! I have a slew of colored and patterned papers and linens that I sort through all the time. The key is to have a good variety so you never get bored. Sometimes, though, I will realize that I've really had a thing for the pallet paired with natural linen and antique silverware (who doesn't?) and have to force myself to think outside of the neutral box, which is typically my preference. Again, challenge yourself! Find a fun linen or paper and work to style your entire scene around it. There are three viewpoints typically used in food photography: front, angled, top. I use them all, typically in each post. If you find yourself always shooting from one direction be sure to switch things up and challenge yourself to a new point of view. The depth of field in an image refers to the depth of the image that is in focus, and is controlled by the camera's aperture. This is a subtle nudge to explore the settings on your camera beyond 'auto'. Again, none of these is the 'right' aperture to set your camera to, but is simply a demonstration of how the story you tell with your art can be influenced by the depth of field. Similar to the depth of field, the point of focus in the image can alter the story told. Below I've focused on the first, the middle, and then the last cake. In the image below that I've focused first on the forks and then on the cake. Quite literally, the focal point will draw attention to the point of the image that you wish to be the focus, and it doesn't always fall right in the middle of the frame. Does the whole dish need to be present in the frame for you to convey its qualities? I often find that less is more. 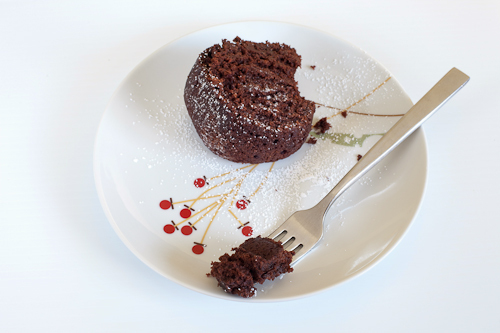 In the case of the two images below, I really wanted to show the sauce I made to accompany the cake. However, the image on the left felt a bit too cluttered, and I was much happier with the shot once I removed the little bowl. Instead, I found two different ways to set up and style additional images with the sauce as the focus. I would probably pair one of these with the image on the right, above, in a blog post. Don't lose sight of the fact that food is meant to be eaten, and showing only the final, pristine cake is not the whole story. Slice it, dish it, eat some of it, and photograph each of those stages. Some of my favorite images show a half-eaten piece of cake or an empty plate, typically found at the end of a post. It is my goal to do as little post-processing as possible, always. My love for photography falls in the styling and capturing of images, not in sitting behind my computer tweaking settings until the image looks nothing like what I caught in-camera. I adore Adobe Lightroom 3, and do most of my editing there. It is a powerful editing program and fantastic for organizing my images, of which I take a lot. For an average Bella Eats post I'll take between 60-100 images, and typically whittle them down to 10 that actually go in the post. Lightroom is great for that process. I rarely take images into Photoshop, and when I do it is usually only to remove a stain from a backdrop paper I've used one too many times, or to collage multiple images together (I am still not happy with doing this in Lightroom, for some reason). I even add my watermark as I export images at web-resolution from Lightroom. The image on the left is straight from the camera, and on the right after a little brightening, a little warming, and a little clarity.....and that's about it. Same for the images below, except I also removed that little paint spot from the homosote, also in Lightroom. I can be picky. Q: What camera equipment do you use for food photography? Preheat oven to 350°F. Butter (8) 4-inch ramekins or (2) 8-inch cake pans. Beat the eggs, sugar, oil, and vanilla in a large bowl until thoroughly combined. Add the flour, baking soda, cinnamon, and salt and mix thoroughly. 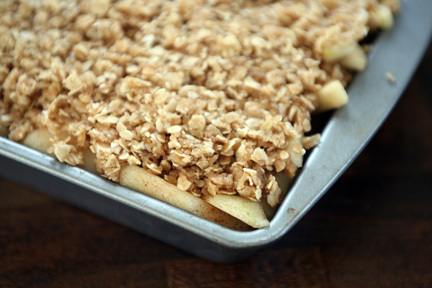 Stir in the apples and nuts until evenly distributed, then spoon the mixture into the prepared baking dishes. We enjoyed ours served with this rum caramel sauce. Happy 4th of July my celebrating friends! I hope you all have fun plans in store for this long weekend, filled with loved ones and sunshine and delicious food. If you're looking for a festive, summery, oh-so-easy dessert to contribute to a backyard barbecue, I've got just the treat for you. This sherbet is perhaps the best I've had. That may be because the berries were grown in my own backyard and I am a bit biased, but I do think even with store-bought or frozen fruit it would be quite delicious. So tart and refreshing; even the bright fuchsia hue screams summer! Enjoy, and have a safe and happy holiday! Puree the berries, milk, and sugar in a blender or food processor until smooth. Strain the puree through a fine-mesh sieve to remove all seeds. Stir in the lemon juice. Refrigerate for at least 1 hour, or up to 1 day. Freeze in your ice cream maker according to manufacturer's instructions. There have been a lot of sweets around here lately. I would apologize, but this little blog is a glimpse into my kitchen and sweets are what I am craving these days. Ice cream. And popsicles. And tiny tartlets with fresh fruit mounded on top. Even though Summer has officially just arrived, here in Virginia you'd think she'd been around for at least the last month. And when Summer lands firmly on our dry + crispy lawn I like for the food passing my lips to be cool and refreshing, laden with flavors of citrus and berry. Of course, there are salads abounding as well, but salads aren't nearly as much fun to photograph, write about, or share here in this space. Except that I've been slicing kumquats to sprinkle overtop of my spinach lately and that, my friends, is a really good idea. If you can find kumquats in your area I suggest you give it a try, I think you'll be pleased. While you're out, pick up a few pints of fresh blueberries, and then hurry home to whip up these sweet little tartlets. The blueberries are such a nice accompaniment to the sharp tang of lemon curd nestled within the butter pastry. You'll only need one of those pints for this recipe, but if you're like me you won't be able to resist eating berries by the handful as you prep. Oh! And if you're in central Virginia, pick up the Summer issue of Flavor Magazine. Not only because Flavor is a wonderful resource for sustainable eating in the Capital Foodshed, but because you may just recognize a photograph in the Pairings section on page 79...! Chantilly cream is one of my great pleasures. I experienced it for the first time at K-Paul's in New Orleans when it was served with my cafe au lait, and I just about licked the bowl. Sprinkled with dried lavender, it is a lovely accompaniment to sweet blueberries. Add in the lemon curd and butter pastry and you've got quite the divine dessert. I should also note that I've never, ever been able to achieve a non-shrinking tart or pie crust. This recipe is suggested by Joy of Cooking for tartlets specifically because the pastry is not supposed to shrink, but, mine still did. Apparently pastry dough and I just don't get along. I'm working on it. Place a medium-size bowl and beaters in the refrigerator, to be used for the chantilly cream. To make the pastry, whisk together the flour, sugar, and salt. Cut the butter and cream cheese into 1/4-inch pieces. Using a pastry blender or 2 knives, cut the butter and cream cheese into the dry ingredients until the mixture resembles coarse crumbs with some pea-sized pieces. Drizzle the heavy cream over the mixture and cut in with the blade side of a rubber spatula, or stir with a fork until the dough begins to gather into moist clumps. Press the dough into a flat disk, wrap tightly in plastic, and refrigerate for at least 1 hour or up to 2 days. On a lightly floured work surface, roll the dough about 1/8 inch thick, then cut into rounds wide enough to cover the bottom and sides of your tartlet pans, with 1 to 1.5 inches extra dough to spare. Press the dough rounds into the pans, then fold the overhanging dough back on itself over the crust sides, doubling their thickness. Press the doubled dough firmly to seal, then thoroughly prick the sides and bottoms with a fork. Arrange the crusts on a baking sheet and refrigerate for at least 30 minutes. Position a rack in the center of your oven and preheat to 400°F. Bake the crusts for 5 to 7 minutes, then prick the bottoms of any that have puffed. Continue to bake until the crusts are golden brown and firm to the touch, 12 to 15 minutes more. For the lemon curd, preheat your oven to 350°F. Combine the sugar and butter in a heat proof bowl. Bring 1-inch of water to a bare simmer in a skillet, and set the bowl of sugar and butter in the skillet. Stir until the butter is melted, and remove the bowl from the skillet. Add the egg yolks and beat until no yellow streaks remain. Stir in the lemon juice and return the bowl to the skillet. Heat the mixture over medium heat, stirring gently until it thickens to the consistency of heavy cream and lightly coats a spoon, 6 to 8 minutes. Strain the lemon mixture through a clean fine-mesh sieve into a bowl, then stir in the lemon zest. Pour the filling into the tart crusts. Bake the tartlets until the center looks set but still very quivery, like gelatin, when the pan is nudged, for 15 to 20 minutes. Let cool completely on a rack. Meanwhile, make the chantilly cream. Combine the cream, vanilla, brandy, and Grand Marnier in the chilled bowl and beat with an electric mixer on medium speed for 1 minute. Add the sugar and sour cream and beat on medium just until soft peaks form, about 3 minutes. Do no overbeat!!! To assemble, pile blueberries on top of each tartlet. Add a generous dollop of chantilly cream and sprinkle with fresh lavender and lemon zest. If you make the tarts ahead, lightly oil sheets of plastic wrap and press directly on the filling in each tartlet. They can be stored in the refrigerator for up to 1 day. Dress with blueberries and chantilly cream when ready to serve. There's something in the water around here. It seems as if Brian and I are surrounded by friends having babies! We have officially become the only couple amongst our close Charlottesville friends who does not have a tiny addition to the family. And, it kind of freaks me out. Just a bit. We're not ready for all of that yet, but it sure does get the gears in your head turning when you're tickling those tiny toes or witnessing first giggles. Those turning gears, they're something that I was never all that sure I would experience and now that I am...wow. Mind-boggling. Brian has asked me more than once who I am and what I've done with his wife, for this whole biological clock thing was never something that either one of us gave a whole lot of merit. Well it exists, I assure you. The arrival of these tiny humans brings along something that I can wrap my mind around...baby parties. The kind where both men and women are invited, and the focus is on good food and fun [yard] games and great friends giving advice to the new parents-to-be. I love an excuse to plan a party, and the arrival of a new being sure seems like a wonderful reason to celebrate! A couple of Saturdays ago I helped to plan a baby party for our good friends Tommy and Kristin. Their little girl arrives in just over a month, and we couldn't be more excited and happy for them! This party was a fiesta of sorts, decorated with bright balloons and citrus-y hues. We had carnitas tacos, and veggie tacos, and cilantro lime slaw, guacamole, black beans, and dulce de leche cupcakes. I fully intended to photograph the carnitas to share with you but, well, when you're co-hosting the party it is tough to remember to pick up your camera. I did manage to capture some images of the cupcakes, so they will have to do. I promise, you won't be disappointed. These cupcakes come from Joy, who never ceases to amaze me with the cleverness of her recipes. If I think of something, chances are Joy's already done it. And every single recipe I've ever tried of hers has been a winner, so I typically don't question her methods. This was no exception. Seriously, who could go wrong with cream cheese and dulce de leche whipped into a buttercream frosting? It is one of the best things you'll ever taste, I promise. Add half of the flour mixture to the egg and butter mixture. Beat on low speed and slowly drizzle in the buttermilk. Beat until just incorporated. 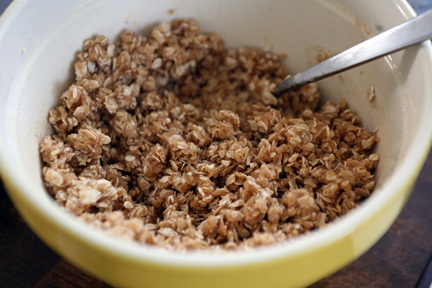 Stop the mixer, scrape down the bowl and add the rest of the dry ingredients. Beat on low speed until just incorporated. Remove the bowl from the stand mixer and finish incorporating with a spatula. Try not to over mix. Divide the batter between the prepared cupcake pans, filling each liner about 2/3 full. 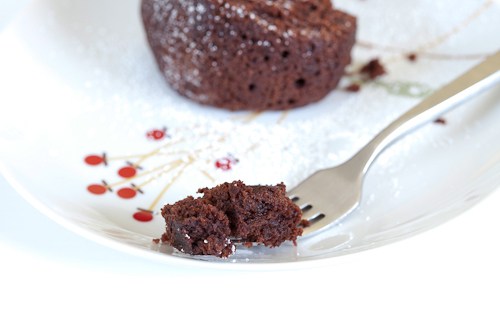 Bake for 18 to 20 minutes or until a toothpick inserted in the center of one of the cakes comes out clean. Let rest in the cupcake pans before removing to a wire rack to cool completely. Cupcakes should be completely cooled before frosting. Place cream cheese in the bowl of an electric stand mixer. Beat on medium speed for about 30 seconds, until very soft and pliable. Stop the mixer, scrape down the sides of the bowl and add the butter and dulce de leche. Beat on medium speed until well incorporated. Stop the mixer and add the salt and powdered sugar. Beat on medium speed for about 3 minutes, until fluffy and lighter in color. Use a large frosting tip to swirl the frosting onto the tops of the cupcakes. Garnish with fleur de sel, or coarse sea salt. For more pictures of Tommy + Kristin's baby party, visit the AHPhoto blog! Two weeks ago I collaborated on a photography session with Soiree. and Rock Paper Scissors. Actually, it was a 6-week process of planning, shopping, meeting, envisioning, and shopping some more. The result was this Mid-Century Modern Wedding concept shoot that I shared on Andrea Hubbell Photography today, and I couldn't be more proud of what we created! I've said it before, but I love my job!!! These adult popsicles were created to help set the mood for a fun afternoon wedding and meal, meant to cool down energetic dancers when they step off the floor. I've only recently discovered Aperol, an Italian aperitif similar to Campari, but with more sugar and less alcohol. It is a blend of bitter orange, gentian rhubarb, and an assortment of herbs and roots. It happens to complement grapefruit juice beautifully, and adds a nice kick of color to a classic greyhound, or these popsicles that required an extra bit of orange to fit in with our 'wedding' decor. You have no idea how hard it is to find a simple, cylindrical popsicle mold! So, instead, I used double shot glasses and 'cookie sticks' bought at a craft store. The shot glasses worked really well, provided a place to wrap the fun pattern created by Rock Paper Scissors, and looked adorable! Mix the water and sugar together in a small pan over a low heat, and bring up to boil until the sugar dissolves. Allow the simple syrup to boil for 4 minutes, remove from heat and cool (makes a little over 1 cup). Combine the citrus juice and Aperol and add 1 cup of the cooled syrup. Adjust to taste: for the grapefruit pops, you may want to add a tablespoon or two extra syrup if you prefer them less tart. Remember, the mixture will taste slightly sweeter in liquid form than it does when frozen. Pour into popsicle molds and freeze at least 8 hours or overnight. To remove, run the molds quickly under hot water, and gently pull out the pops. There are a few foods that take me way, way back to my childhood. Orange danishes. Cheesecake. Anything combining peanut butter and banana. My momma's macaroni and cheese, her banana bread, and especially her banana pudding. Do you see a trend here? Banana popped up several times...I really, really, like banana. So you can imagine my excitement when my Charlottesville friend Stephanie, someone whom I think very well could have been separated from me at birth, brought homemade banana pudding ice cream to her dinner table one evening. And then again when Steph was spending an afternoon at my house, pointed to the pile of overripe bananas on my counter and said "Let's make ice cream! Right now." And now, when I sneak out to the kitchen mid-day, slip a spoon from a drawer, and sink it into the container of what's left for an afternoon pick-me-up. This flavor will forever remind me of my Momma. Banana pudding was one of my very favorite edibles while growing up, but sitting here today I can't remember ever making it for myself as an adult. Its the kind of recipe that mommas make, and until I am one, I don't know that I will. But this ice cream, it takes the best of what banana pudding is...the creamy texture, the crunch of vanilla wafers, the real bananas puréed smooth...and creates a simple, elegant, dinner-party-worthy dessert. One that leaves you mostly speechless, lost in thought, and thoroughly happy. My life has been a little sweeter lately because of banana pudding ice cream mingled with memories of home and youth. Steph, I owe you. Big time. I wish that I could take credit for this fabulous recipe, but I cannot. This one I owe to my dear friend Stephanie, ice cream goddess and all-around awesome lady. In a medium-size bowl whisk together the egg yolks, sugar, and salt, and set aside. In a medium-sized saucepan, heat the milk and 1 cup of the cream just to a slow boil. Remove from heat and add to the egg mixture, whisking constantly. Pour the mixture back into the saucepan and heat gently, stirring constantly, until a candy thermometer reads 170˚. Do not bring to a boil or it will most likely curdle. Remove from heat and allow to cool for 5 minutes. Pour custard through a fine-mesh strainer into a large bowl. Add the remaining cup of cream and the vanilla, and stir to incorporate. Add the puréed banana and stir to combine. Cover the bowl loosely with plastic wrap and refrigerate for 1 hour. When the mixture is cool, cover the bowl completely with plastic wrap and refrigerate overnight. The next day, pour the mixture into the frozen bowl of your ice cream maker and follow manufacturer's instructions. About 3 minutes before the ice cream is done freezing, add the vanilla wafers. Charlottesville is beautiful this time of year...lush new grass, lacy clouds of dogwood blossoms, confetti-hued azalea bushes. But my heart, it lies in another city at the end of April. Far, far south of here, where the air is heavy with music and the scent of chicory. Five years ago this Thursday, Brian and I were married against a cracked brick wall in a classic New Orleans courtyard on the most beautiful day of our lives thus far. With 35 of our closest friends and family we paraded through the French Quarter, led by a jazz quartet we'd met on Royal Street during our very first visit to the Big Easy. I walked down the aisle to "It's a Wonderful World", we said our vows with our two best friends by our sides, we danced with those we love most, we ate incredible food for hours. What a day...and so hard to believe it was five years ago now. Yes, this time of year has me longing for New Orleans. We were married in the midst of crawfish season, and luckily for us, we have a local market that brings crawfish into Charlottesville at exactly this time of year, just for our anniversary. Well, maybe not just for us, but the timing sure does work out well. On Friday, Brian brought home with him 1 dozen oysters, 4 pounds of crawfish, and 6 blue crabs. A flash decision was made and I found myself scrambling to make a bread pudding, the perfect ending to the NOLA Seafood Boil suddenly placed on our Friday night agenda. That dinner with dear friends was the next best thing to being in our favorite city, and another evening I won't soon forget. Bread pudding is a classic New Orleans dessert. It is one that, when we first visited the city, I was entirely unconvinced of. I've come to my senses in the last few years, and might have recently declared bread pudding one of my favorite sweets. I won't deny that. This particular recipe was a new one for me, pulled from Chef Paul Prudhomme's classic cookbook, which hasn't led us astray yet. Chef Paul is a bit of a culinary god in our house...the man did invent the blackening method after all. I expected him to pull through for me again here, and we were not disappointed. This is a traditional bread pudding, made with stale bread and sweet custard and pecans and raisins, topped with Chef Prudhomme's fabulous Chantilly Cream. Because I wasn't expecting to make bread pudding (or any baked good at all, actually) last Friday afternoon, I found myself lacking in some ingredients. But even with a bit of tweaking it was a big hit, and I think the changes made might be permanent. Bread pudding is best while still warm, but also makes for a really, really good cold breakfast. Trust me...it will sing with your coffee. In a large bowl, beat the eggs on high speed until extremely frothy and bubbles are the size of pinheads, about 3 minutes (or with a metal whisk for about 6 minutes). 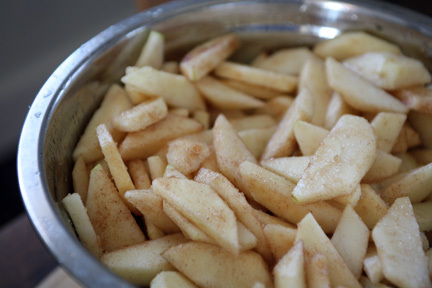 Add the sugar, vanilla, nutmeg, cinnamon, and butter and beat on high until well blended. Beat in the milk. Butter (8) small ramekins, (1) 9x5 loaf pan, or (1) 9" square glass dish. (Truly, any of these works.) Place a layer of bread cubes in the greased pan(s). Sprinkle with the golden raisins and nuts and layer bread cubes over top to fill pan. Pour the egg mixture over top of the bread cubes and toss (or gently press the cubes down into the liquid so that all are coated, but not covered). Let sit for about 45 minutes, pushing the bread down into the liquid occasionally. Preheat oven to 350°. Place the pan(s) in the preheated oven and immediately drop the temperature down to 300°. Bake for 40 minutes, until top is just starting to golden. (If you use small ramekins, bake for just 25-30 minutes). Increase the oven temperature to 425° and bake until pudding is well browned and puffy, about 15 to 20 minutes more. Refrigerate a medium-size bowl and beaters until very cold. 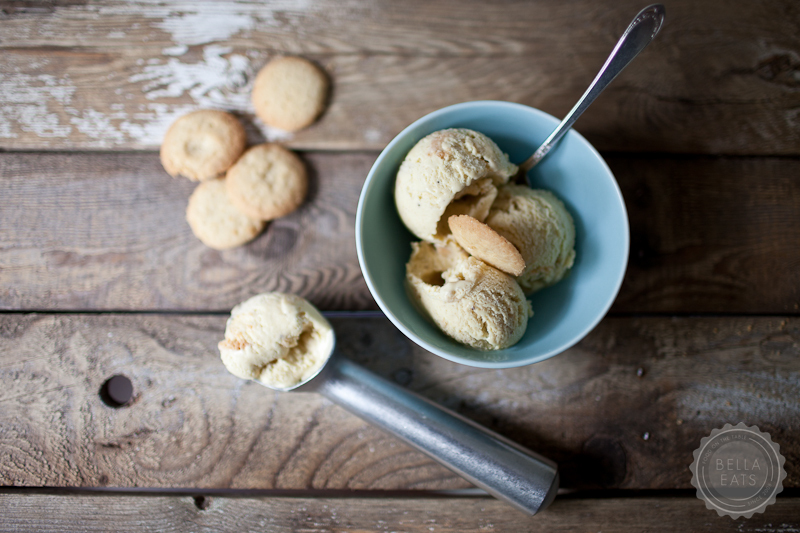 Combine the cream and Amaretto in the bowl and beat with a handheld mixer on medium speed for 1 minute. Add the sugar and sour cream and beat on medium just until soft peaks form, about 3 minutes. Do not overbeat! Try not to eat the entire bowl. But if you do, I understand completely. Spring. My backyard has gone from yellow to pink to white (or, daffodils to plum and apple blossoms). Each afternoon over 60° has me longing to get outside, in the sunshine, with a glass of white wine in my hand. Preferably, with my husband or a girlfriend by my side and my dogs at my feet. This season brings with it a jovial state of mind. And with that comes the desire to be amongst friends, sharing in the pleasantness of open windows and the greenish light of sunbeams passing through new growth. I found this recipe last year on Melanger, and it is not surprising that after making it once it has remained at the top of my list. 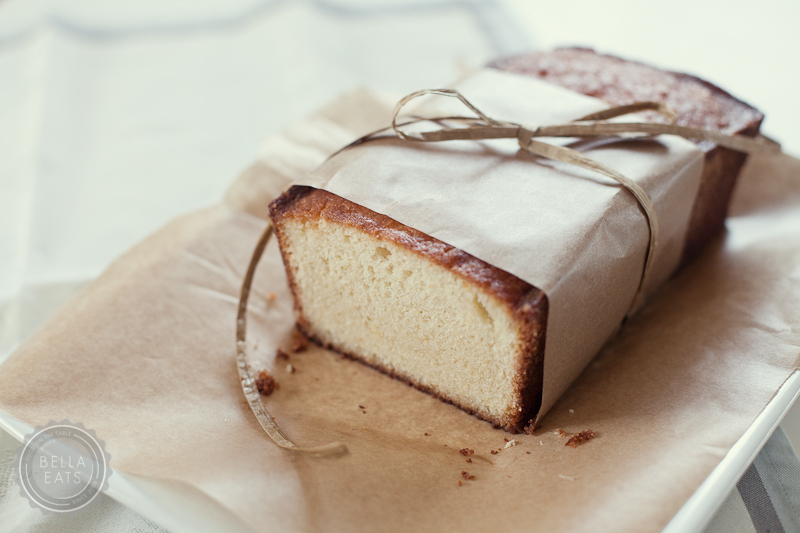 Julia's taste in baked goods is steady; never too rich, most often simple and leaning towards rustic, always comforting. If you haven't yet, you should visit her lovely site. I realized this time, after I'd already prepared the pan and staged the table for photographs, that I was out of vanilla extract. So, I used a full teaspoon of almond extract instead. The cake is delicious both ways. Place a rack in the center of your oven and preheat oven to 350°. Butter a seasoned 9-inch cast iron pan. (If you don't have a cast iron pan, a 9-inch cake pan works as well). Pour sugar into a medium bowl and add lemon zest. Use your fingers to rub the zest into the sugar, until the sugar is moist and fragrant. Add the salt and extracts and whisk to combine. Stir in the flour using a rubber spatula. Pour batter into your prepared pan and smooth top with rubber spatula. Sprinkle almonds over the top of the batter and finish with a sprinkle of sugar. Bake for 25-30 minutes until the edges are golden brown and starting to pull away from the edge of the pan. Its that time of year again, when each week offers a party of some sort, when all around our house you’ll find little pieces of paper scribbled with frantic ‘to do’ lists, when our kitchen becomes coated with a fine film of flour and the den floor is sprinkled with a confetti of wrapping paper, ribbon and tape. Our tree is up and decorated, a Christmas-themed Pandora station dialed into the iPod sitting in its dock, and my cravings for mulled cider and creamy eggnog are daily occurrences. There’s no denying it, the holidays have latched on to our life and won’t be letting go until January. I am feeling particularly festive this year, I think because, for the first time ever, Brian and I are staying in Charlottesville for Christmas. In our own house with our own vintage-inspired silver tree and fresh wreath hanging on our door. We’re pretty excited, especially since we managed to convince two of our four sets of parents to come and visit. We’ll have my momma and stepfather for Christmas and Brian’s dad and girlfriend to help us ring in the New Year. Thats two big meals to host and we, who love to entertain, have already started planning the menus. By now you’ve all probably figured out that I love to bake. Dessert is the first course of menu planning that I tackle, I can’t bring myself to buy bread from a store if we’re having guests over for a meal (unless its an Albemarle Baking Co. baguette, because they are magical) and whenever I am asked to contribute a dish to a dinner party I offer up a cake or pie. I’ve developed a bit of an obsession, and have been known to get downright giddy as I browse my cookbooks and magazines looking for the perfect cookie recipe. So, as you can imagine, I get pretty darn excited about holiday baking. These days I'm leaning towards heavy, comforting desserts; dense cakes, thick custards, rich pies. I'm craving chocolate, in all forms, the darker the better. I've dog-eared pages to mark recipes for Spiced Ginger Cookies, Rum-Drenched Pound Cake and Dulce de Leche Bread Pudding. 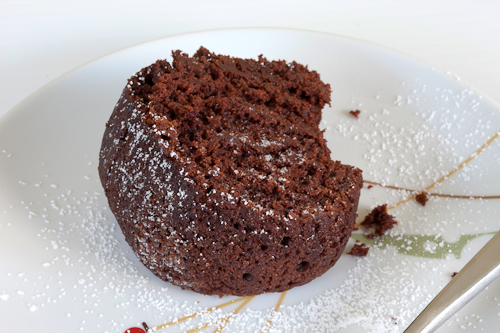 And for this Chocolate Bourbon Bundt Cake, which I actually made for a dinner with friends months ago. That was before the cold air hit Charlottesville and, while this dessert is really good no matter the time of year you make it, when I took my first bite I couldn't help but to think of December. And hot cider. And twinkling lights on trees. And snow. This gem of a recipe will surely have a place on one of our holiday menus or perhaps as a take-along dish for a party. Dense and moist with a deep, dark chocolaty flavor laced with a hint of bourbon, the cake is easy to make, better when made a day or two in advance and, to top it all off...positively dreamy. I promise that not a crumb will remain after your party. But if I'm wrong and there are some leftovers, a thick slice makes a mighty fine accompaniment to your morning coffee. 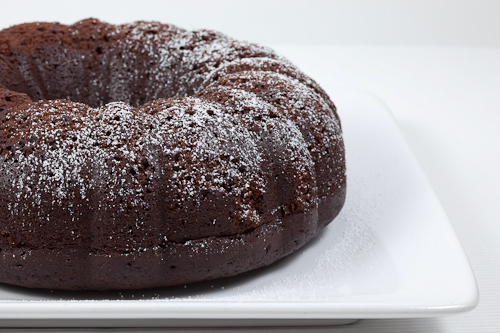 As chocolate cools, whisk together the flour, baking soda and salt in a bowl. Whisk together the eggs and vanilla in a small bowl, then whisk into cooled chocolate mixture until combined well. Add flour mixture and whisk until just combined - the batter will be thin and bubbly. 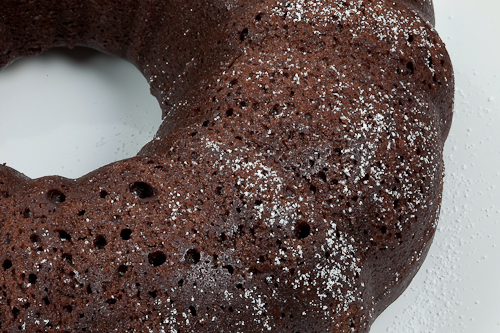 Pour batter into bundt pan and bake until a wooden pick or skewer inserted in center comes out clean, 40 to 50 minutes.